The Nile: A Sustainable Resource? The sustainability of the Nile as a water resource is investigated using maps, photos, data, graphs and a role-playing activity. Student groups will represent each of the 10 countries in the Nile River Basin. Data cards are provided for students to gather information on each country, including current and projected population, water status, water management issues and water resource goals. That information is shared, discussed and evaluated at a simulated meeting of the countries. The URL opens to the investigation directory, with links to teacher and student materials, lesson extensions, resources, teaching tips, and assessment strategies. 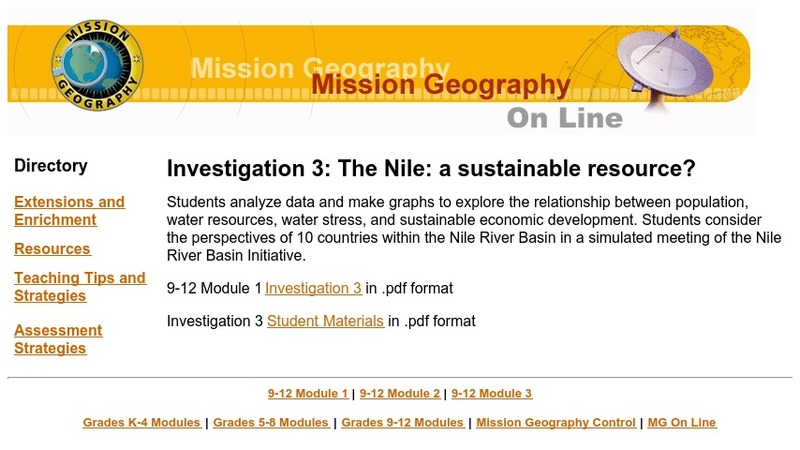 This is Investigation 3 of four found in the Grades 9-12 Module 1 of Mission Geography. The Mission Geography curriculum integrates data and images from NASA missions with the National Geography Standards. Each of the four investigations in Module 1, while related, can be done independently.